A new survey suggests U.S. consumers are largely unaware of the severity of global resource scarcity, but their choice of packaging would be impacted if they had readily available information on how renewable materials mitigate climate change. Tetra Pak and the Global Footprint Network conducted a survey of 1,000 U.S. consumers about their grocery spending habits. An overwhelming 86 percent agreed that if they knew the use of renewable packaging contributed to reducing carbon emissions, it would impact their choice of packaging. Women were particularly motivated to choose renewable packaging options based on this knowledge: 90 percent of females said they would modify their purchasing habits while 77 percent of men did. According to TetraPak, consumers indicated that they are ready to be held as accountable as government and industry for climate change, and they are ready to support actions to mitigate its harmful effects. While 81 percent of respondents said that no one group is responsible for addressing natural resource constraints, the majority also believes that no single group is doing enough. “Our survey confirms our belief that with information and education, consumers will respond favorably to the need to pay closer attention to resource challenges and change their individual actions, including making more environmentally responsible decisions around packaging,” said Elizabeth Comere, Director of Environment & Government Affairs for Tetra Pak US and Canada. seeking out food or beverage products that come in renewable packaging (69 percent). Daily purchasing choices can make a difference, said Mathis Wackernagel, president and co-founder of Global Footprint Network. These findings coincide with Earth Overshoot Day, an indicator of when humanity has used up nature’s ‘budget’ for the entire year. Global Footprint Network announced Wednesdaythat we have overshot faster than ever: Overshoot Day moved from early October in 2000 to August 13th this year. This survey follows Tetra Pak’s launch of the first carton made entirely from renewable packaging materials last year, and is the latest evidence that consumers desire more sustainable packaging options. Tetra Pak introduces milk cartons made entirely from plant based materials. Finnish dairy producer, Valio, has become the first company in the world to sell products to consumers in Tetra Pak’s carton packaging made entirely from plant-based materials. The cartons are manufactured from a combination of plastics derived from plants and paperboard. It is claimed to be a world first and, says Tetra Pak, is a milestone in its commitment to drive ever-stronger environmental performance across all parts of its portfolio and operations. The low density polyethylene used to create the laminate film for the packaging material and the neck of the opening, together with the high density polyethylene used for the cap, are all derived from sugar cane. These plastics, like the Forest Stewardship Council (FSCTM) certified paperboard, are traceable to their origins. The Tetra Rex fully renewable package can be identified by the words “Bio-based” printed on the gable of the package. Elli Siltala, marketing director at Valio said: “Valio is committed to increasing the share of renewable resources in its packaging material. We share a common vision of innovation and environmental responsibility with Tetra Pak and we are proud to be the first in the world to make our products available in a fully renewable carton package.” The milk drink will be available in one-litre capacity Tetra Rex Bio-based packages, with a cap made of sugarcane and will use Tetra Pak filling machine. Post originally appeared on 2 degrees network. Timberland’s partnership with Omni United will create co-branded automotive tires specifically designed to be recycled into footwear outsoles when their road journey is complete. According to a joint press announcement, Timberland and Omni United first conceived this partnership three years ago, when sustainability leaders from both brands came together to address a longstanding shared concern. The tire and footwear industries are two of the largest users of virgin rubber. The majority of tires on the market today have a limited life span; ecologically-sound disposal at the end of that life span presents yet another challenge. Tire retailers will set aside used Timberland Tires for recycling after consumers purchase new tires to replace their worn out tires. Omni United is partnering with Liberty Tire Recycling and its network of tire collection and recycling firms to sort and segregate the Timberland Tires at the companies’ facilities. The used tires will be shipped to a North American tire recycling facility where they will be recycled into crumb rubber. The crumb rubber will be processed further into sheet rubber for shipment to Timberland outsole manufacturers. The rubber will be mixed into a Timberland-approved compound for outsoles that will ultimately be incorporated into Timberland® boots and shoes. This blended compound will meet the company’s exacting standards for quality and performance, as well as its stringent compliance standards. Timberland Tires will be sold initially in the United States at leading national and regional tire retailers, as well as online through a state-of-the-art e-commerce platform. For more information about Timberland Tires, visit www.timberlandtires.com. In a new campaign celebrating the benefits of the great outdoors, The North Face introduces a video today encouraging city dwellers to embrace nature and the environment. Using Woody Guthrie’s venerable This Land Is Your Land reworked by My Morning Jacket, the campaign subtly demonstrates the uplifting benefits of outdoor activity. The centerpiece of the campaign is the 90 second video. The spot closes with the store’s long-running slogan, “Never stop exploring,” and urges consumers to download the new recording of the song from iTunes. The download will cost $1.29, with Apple pocketing its customary third and the rest going to the 21st Century Conservation Service Corps within the United States Interior Department, which hires veterans and at-risk young people to restore and preserve public land. Additionally, the retailer is contributing $250,000 to the corps. Cause Driven Social Campaigns More Effective Than Brand Stories. New research released in London this week points to the effectiveness of cause driven social campaigns activated by brands – showing superior business results than traditional brand communication stories, especially in social media. In the report, Seriously Social by marketing consultant Peter Field, research indicates that not only were cause-driven campaigns better at delivering business effects — they also generated greater numbers of brand effects once the non-profits were removed from the equation. Field analysed case studies from the Warc Prize for Social Strategy – a global competition for examples of social ideas that drive business results – defined social strategy as any activity designed to generate participation, conversation, sharing or advocacy. “Cause-driven campaigns are more strongly associated with business effects,” Field stated, a finding that became even clearer when stripping non-profit campaigns out of the calculation. Field was able to compare the impact of campaigns that associated a brand with a good cause, with the impact of those that built a story around a brand. He found that media usage for cause-driven campaigns was more strongly focused on online, WOM/earned media and traditional advertising channels (excluding TV). Brand story campaigns, in contrast, made wider use of media channels and, as they were more likely to be short-term campaigns, included much more activation. These patterns had an impact on subsequent effectiveness. The business effectiveness of cause driven-campaigns was found to increase markedly over time, whereas that of brand story campaigns did not. “Again, this is a reflection of the short-term outlook of the latter group,” Field said, who suggested that conclusions about effectiveness drawn over a period of less than six months would underplay the true strength of cause-driven campaigns. 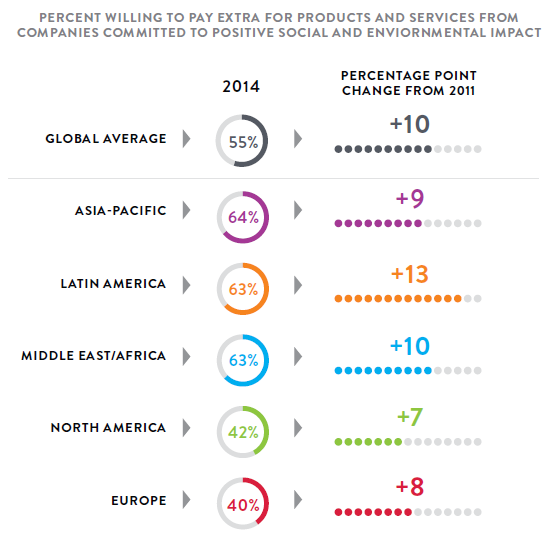 55% of global respondents in Nielsen’s corporate social responsibility survey were willing to pay extra for products and services from companies committed to positive social and environmental impact—an increase from 45% in 2011. However, people living in North America lag the global average, with only 42% saying they would be willing to pay extra – a 7% increase from three years ago. As continued impactful climate change events and social consciousness raises people’s concern about companies’ impact on society, the importance of brand’s corporate responsibility reputations will continue to rise. Brands which act responsibly and communicate those actions effectively will increasingly be the ones rewarded by consumers. 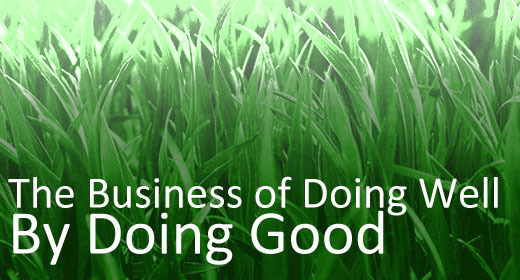 Unilever has launched a worldwide new initiative to motivate millions of people to adopt more sustainable lifestyles. Launched yesterday on Universal Children’s Day in Brazil, India, Indonesia, the UK and the US, Project Sunlight aims to make sustainable living desirable and achievable by inspiring people, and in particular parents, to join what Unilever sees as a growing community of people who want to make the world a better place for children and future generations. Project Sunlight was launched with the four-minute film embedded here and created by DAVID Latin America and Ogilvy & Mather London at dawn on November 20th in Indonesia and then follow the sun to India, the UK, Brazil and the US. Additional information can be found at an online hub – www.projectsunlight.com – which brings together the social mission stories of Unilever’s brands across the world, and invites consumers to get involved in doing small things that help their own families, others around the world and the planet. To mark the launch of Project Sunlight on Universal Children’s Day, Unilever will be helping 2 million children through its ongoing partnerships, providing school meals through the World Food Programme; supporting Save the Children to provide clean, safe drinking water; and improved hygiene through UNICEF. Ogilvy & Mather Chairman and CEO Miles Young, explains: “Unilever asked us to find a new way to talk about sustainability that would make the benefits real for ordinary people. Project Sunlight is founded on the principle that even small actions can make a big difference and that together, we can create a brighter future. We are honored to be a part of such a positive and significant movement for the good of our client and our communities.” Famed film director Erroll Morris directed “Why bring a child into this world?” including moving interviews with expectant parents from around the world. The project draws on the legacy of Unilever’s founder Lord Leverhulme, who believed that he could change the world with a brand of soap he called Sunlight. Kudos to Unilever, Ogilvy, DAVID and everyone involved in this important initiative that hits at the heart of the matter: if we can’t work to improve living conditions on our precious planet, how dare you bring a child into this world.